See complete table clamp/ socket selection below. Precision locking teeth designed for long life. 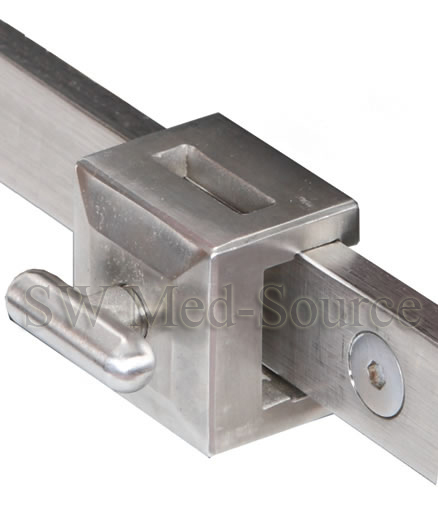 This surgical table clamp features durable stainless steel construction. It includes precision locking teeth designed for long life. 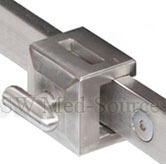 Compatible with all U.S. made operating room table rails. Standard U.S. table rails measure 1 1/8" x 3/8". Accepts round posts up to 11/16" diameter. Snaps on anywhere on the O.R. Table Rail. 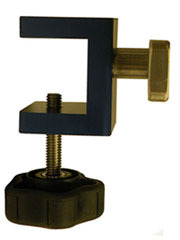 Accepts Round posts up to 3/4" diameter and flat bars. All #304 Stainless Steel construction. It's like having two clamps in one! point along the table side rail. 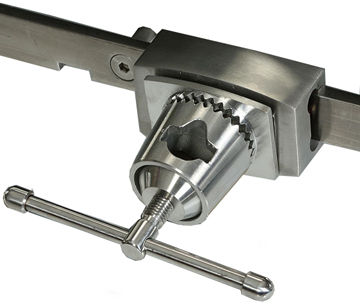 This spring-loaded autoclavable surgical table clamp conveniently attaches to any place along the table rail. It just snaps into place. Removal is just as easy. Just lift and remove. Attaching the clamp to any place along the side rail means you won't have to attach the clamp to the side rail notches. No longer will you have to slide it along the rail into the desired position. Neither will you need to remove the patient safety strap in order to place the clamp into the desired position! This improves O.R. safety and saves valuable patient set-up time. Since this clamp accepts both flat 1" x 3/8" blade or 5/8" round mounting posts, it's more useful and cost effective than other clamps. No longer do you need to search around for the right type of clamp. This unique table clamp with a swivel design allows for positioning of your accessories in the vertical or horizontal position or anywhere in between. 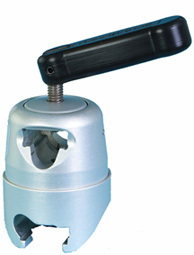 The hardened clamping surface creates maximum pressure - preventing movement of all accessories. It locks accessories securely with a quick turn of the durable ergonomic handle. It can attach to the rail at any location over multiple drapes. It accepts accessories with round posts up to 5/8" diameter and flat posts 1" x 3/8". Patient weight capacity is 800 lbs. Quick and easy pull-to-release lever. 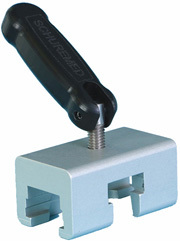 Securely locks accessories with a flat 1" x 1/4" mounting post. Attaches at any place along the side rail. Eliminates the need to attach the clamp to the side rail notches. Thus you will not have to slide it along the rail into the desired position. Attaches at O.R. table rail ends or notches. Allows accessories to be mounted vertically or horizontally. Securely locks accessories with a flat 1" x 3/8" mounting blades anywhere along the table side rail. Patient weight capacity is 720 lbs. 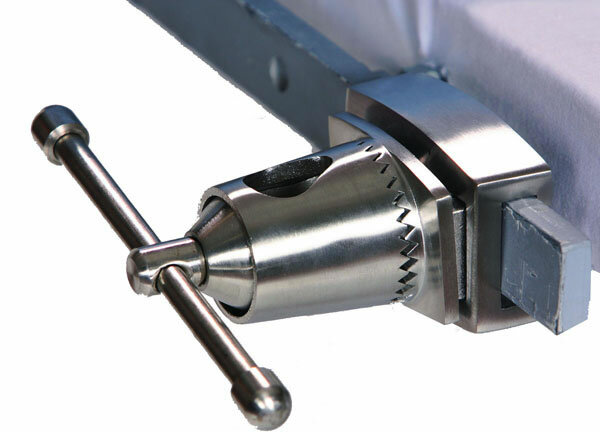 The Deluxe Rail Clamp is designed for a wide-range of purposes; affixing most operating room table accessories to most OR table designs and brands. 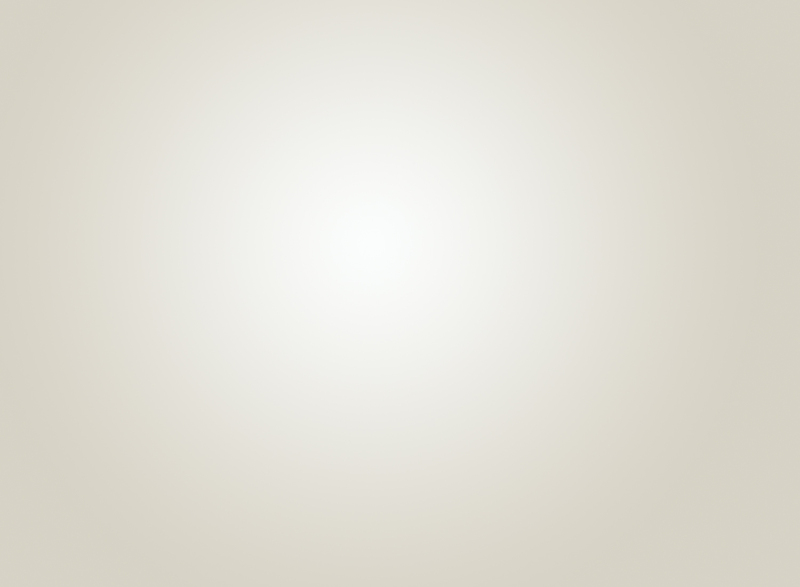 Designed for ¼" flat blade style accessories. This aluminum surgical table clamp is designed for use with 1" x ¼" flat blade style operating table accessories. Perfect for table top extensions and knee board applications. Reduces the free play associated with standard clamps. 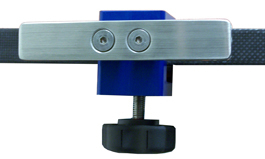 Accepts standard flat blade style accessories that measure 1" x ¼". Identical design to many clamps that come as a standard accessory with many new operating tables. Durable stainless steel construction means durability and long life. Rail Clamp with 6" long Extender Rail. patient in an unsafe position. The extender rails are especially helpful with armboard placement when prone positioned patients have been placed into a neuro surgical headrest. This 6" long extender rail is welded to the side rail clamp. The clamp attaches at accessory rail ends or notches. 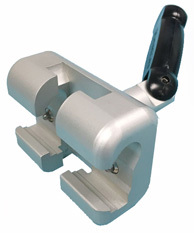 Secures to rail with stainless steel turn handle. The clamp itself will accept standard flat blade style accessories that measure 1" x ¼". Stainless steel construction means durability and long life. made with silver polished aluminum color. 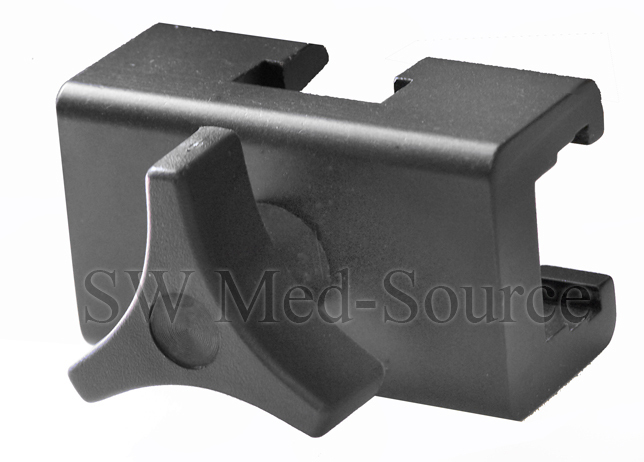 This spring-loaded table clamp conveniently attaches any place along the surgical table rail. Removal is just as easy. It accepts both 5/8" round or 1" x 3/8" flat blade style mounting posts. It's like having 2 clamps in 1. Holds accessories in either the vertical or horizontal positions. Locks securely with a simple twist of the ergonomic handle. Patient weight capacity is 350 lbs. on tables with beveled or raised edges. Quickly and easily attach this clamp with a rail to your imaging table making it more versatile for your accessory needs. Features a clamp opening of 1½". So it is designed to be compatible with all types of imaging tables. The Stainless Steel rail is 6” long x 1 1/8" high x 3/8" thick. It is the same type of rail used on all U.S. made surgery tables. This rail is designed to be used with armboards, Clark sockets and other types of table clamps that are typically used on U.S. made surgery tables. Once a clamp is securely attached to this rail, you can then insert a variety of table accessories such as leg and arm preppers. Note: Do not exceed your table manufacturer's recommendations regarding patient weight distribution. Always insure that your patient is safely secured to the imaging table when using any table accessory. 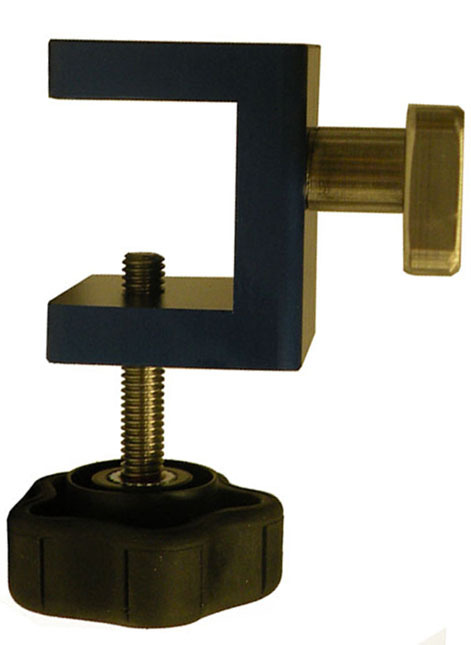 This heavy-duty clamp is designed to attach to your imaging table without damaging your table top. 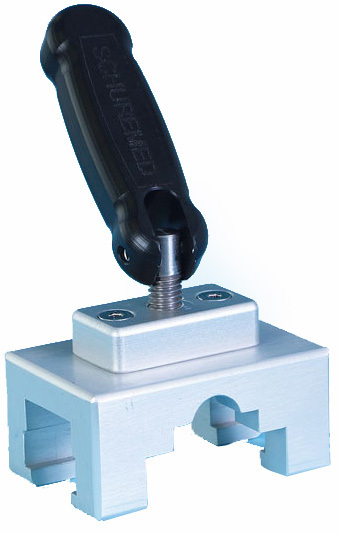 Note: This squared-off clamp will only work with squared-off table edges. It will not work on tables with a raised/ beveled edge. Average delivery time is 1 to 2 weeks.